Amid speculation about the bombing, a great city and its people are responding to tragedy with a strength that is the stuff of poetry. It happened that I was scheduled to do a Boston radio show Monday afternoon. We were going to talk about national politics. But the deadly bombing at the Marathon changed everything, not just in Boston, but nationally. It was one of those days when we all had to pause and reflect on where our country is at, and where it might be headed. But it was not the first such day. We’ve had a lot of them. Indeed, we have had a lot of them in mid-April. We all know April 15 as Tax Day. But is also a day that has seen deep tragedy. One hundred forty-eight years ago, on April 15, 1865, Abraham Lincoln died. Lincoln’s assassination by John Wilkes Booth terrified a nation—not just Northerners but Southerners who had only days earlier concluded a brutal Civil War and who understood the importance of Lincoln to the reconciliation of the Republic. One hundred thirty years after that agonizing period in American history, on April 19, 1995, Timothy McVeigh terrified the nation when he drove a truckload of explosives to the Alfred P. Murrah Federal Building in downtown Oklahoma City. Enraged by the siege two years earlier at the Branch Davidian complex in Waco, Texas, McVeigh committed what would be recognized as the most destructive act of terrorism on American soil until the September 11, 2001, attacks. As I talked with my friend Jeff Santos on his Boston radio show, and as I participated in other interviews Monday, plenty of calendar connections were mentioned. It was on April 20, 1999, that the Columbine killings took place in Colorado, and on April 16, 2007, that the Virginia Tech massacre was carried out. The calendar seems to have a dark spot in mid-April. But we should be careful about seeing it as much more than that. In various interviews Monday, I was asked (as someone who wrote extensively about the Oklahoma City bombing and who was in Washington and wrote a great deal from that city on 9/11) whether there might be a connection that could tell us something about the Boston attack. I kept coming back to a memory of 1995, when a number of “experts” suggested in the immediate aftermath of the Oklahoma City bombing that it looked to be the work of terrorists with Middle East connections. The speculation was linked to recent history; the World Trade Center had been attacked in 1993 by conspirators, later identified as Muslim extremists with ties to terrorist cells, who had used a truck bomb. But the speculation with regard to Oklahoma City was off the mark. Ultimately, on that day, it was another link to recent history that had meaning. McVeigh was furious with his government’s actions in Waco, where a long standoff had come to a violent conclusion two years to the day before he attacked the Oklahoma federal building. The memory of past mistakes and miscalculations provides at least a measure of instruction for moments such as these. People look for explanations. And sometimes for scapegoats abroad, and at home. They get excited, angry and maybe a little too certain that they have the answers; on social media, there was a lively debate about calendar connections. When I noted a few that were being discussed in broadcast reports Monday, people came back with more—including references to the sinking of the Titanic on April 15, 1912. But I think most people recognized that the ironies of timing are usually just that. Most people also recognized that we ought not lose sight of what is most important in this moment. Boston is a city of great history. But on Monday, the people of the city—and the runners who had come to join its great Marathon—wrote a new chapter. There was tragedy, yes. But there was, as well, epic courage. And we should note both. At the same time, it is necessary to identify those responsible for the bombing, to hold them to account and to assure that proper steps are taken to maintain public safety in a free society. There is nothing wrong with Americans expressing opinions about the inquiries, prosecutions and official responses—passionate opinions, political opinions. The freedom to engage in these debates is an American birthright won in struggles that can be traced to the Boston streets where Sam Adams and Paul Revere and Crispus Attucks forged an ideal of liberty. They also sought and established the rule of law. And it is valuable to recognize that we can and should place a good measure of trust in the able investigators who already are at work tracking down the killer or killers who committed a heinous crime in Boston Monday. As the president suggested in his statement to the nation, their reasoned conclusions—as opposed to speculation—are what should take us from the “investigation stage” to the accountability moment. While we can be cautious about drawing conclusions from the calendar, however, there is one historic connection that is of consequence. In Massachusetts, Monday was marked as Patriots’ Day. 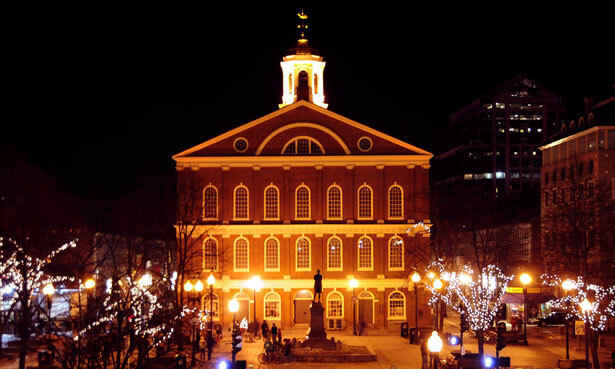 It’s a state holiday set aside to recall the first struggles of the American Revolution, which played out on late nights and early mornings in mid-April of 1775. Patriots’ Day is when we remember the events leading up to the battles at Concord and Lexington, when farmers and shopkeepers challenged soldiers of the mightiest military force on the planet. The country forged by those rebels against the British Empire has experienced great trauma, misery and pain. But it has also known courage, in Middlesex villages and towns 238 years ago, and in Boston on Monday, where police officers and rescue personnel ran to aid the victims of the bombing before the smoke had cleared. Where Mayor Tom Menino, recovering from surgery, checked himself out of the hospital and took charge of the response. Where runners in the Marathon kept on running to a nearby hospital where they gave blood to aid the victims of the attack. And, thanks in no small part to the poet, we all recall that the rebellious Paul Revere was a Bostonian who rode at the signal from his great city’s Old North Church. The church remains, a touchstone of liberty that is strong in the present. The same can be said of the city. This is a history worth telling. Read Dave Zirin's reflection on the legacy of the Marathon.